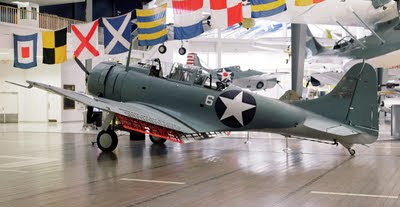 We recently visited the National Naval Aviation Museum at the U.S. Navy base in Pensacola, Florida. It is an impressive facility, with over 150 aircraft on display, ranging from the early days of U.S. Navy aviation up to modern Blue Angels jets; and admission is FREE! We usually do not take guided museum tours, but for some reason, the wife suggested it, so we did. Our tour guide, whose name I believe was Wheeler, was a retired U.S.N. ordinance and flight crew member who served on the U.S.S. Enterprise - not the nuclear powered aircraft carrier currently in service (CVN-65); but the 1936 aircraft carrier U.S.S. Enterprise (CV-6) that fought the Battle of Midway in 1942, and went on to become the most decorated U.S. Naval vessel of World War II. He loaded bombs that sank the Japanese Imperial Navy aircraft carrier Hiryu, and served as a rear gunner on a SBD Dauntless dive bomber (above). This 89 year old man was a walking, talking piece of American history, who not only gave the expected information in his tour, but his personal recollections of life in the Navy during World War II, as well as a touching story about his meeting a former Japanese pilot from the Hiryu who visited the museum. Today's cartoon is another Max Fleischer short from the Internet Archive called Dancing on the Moon. 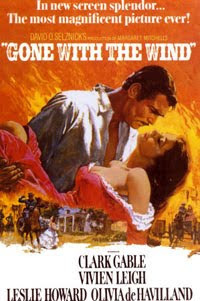 The Orpheum Summer Movie Series has only two shows left, and tonight they bring out the big guns with the blockbuster hit of 1939 (which was a blockbuster year for Hollywood): Gone With The Wind. The show starts at 7:15 p.m., and tickets go on sale one hour earlier. This week, the Red Hot Lindy Hop features live music from Jeremy Shrader's Quintessentials. Doors open at 6:30 p.m. Free lesson at 7:00 p.m. Swing dancing from 7:30 to 9:30 p.m. Dress like you are going out. 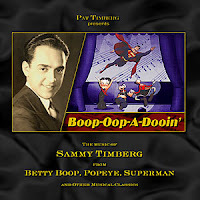 Boing Boing has a post about Sammy Timberg, who was a composer of incidental music for some of Max Fleischer's cartoons, including Betty Boop, Popeye and Superman. His daughter made modern recordings of these classic cartoon melodies and released them on CD entitled Boop-Oop-A-Dooin'. It appears that one of the ideas behind this one-legged, "hopping" tank was that it would make a difficult target for enemy fire. While that is logical, I cannot help but wonder about the accuracy of the gun crew within the tank considering its unusual locomotion. From Google Patents via Boing Boing. I just finished reading Sir Richard Burton's translation of Ali Baba and the Forty Thieves (Ali Baba was neither their leader nor one of the Forty, by the way), so I could not resist posting this classic 1937 animated short in which Popeye the Sailor meets the Forty Thieves. There were only a few of these longer, color Popeye cartoons in the 1930s, and they show the very effective three dimensional technique that the Fleischer studios employed. In this 1930 film clip of Helen Keller and her teacher, Anne Sullivan, posted on Boing Boing, they describe how Ms. Sullivan taught the blind, deaf and originally mute, Ms. Keller to speak. The word "amazing" is a gross understatement. Click HERE for a Swing Shift Shuffle playlist from last night's show. The Red Hot Lindy Hop continues their weekly dance session this Friday at the Rumba Room, and next week they will have live music! DJ music until 9:30 p.m., and Salsa from 9:30 until ? Free admission before 7:00 p.m., and $5 at the door after 7:00. Lesson with Kimmie and Jaredan. Music by DJ Jaredan. Dress like you're going out. Live music with Jeremy Shrader's Quintessentials. Band cover: $7. Lesson with Kirk & Jeska. If you are a fan of slapstick master comedian Red Skelton, then you are in for a treat. 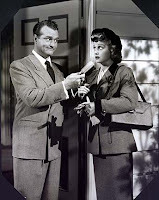 Beginning at 6:15 a.m. (Central) on Wednesday, August 19, Turner Classic Movies will show no less than 14 of his films from the early 1940s through the early '50s, including Du Barry Was a Lady, featuring Lucille Ball. Full listings HERE. 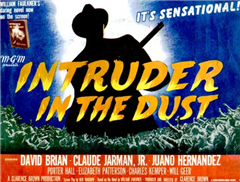 Intruder in the Dust is a movie based on a short story by William Faulkner of the same name. Shot in and around Oxford, Mississippi in 1948-49, the film premiered 60 years ago in October. To commemorate the event, the Lyric Theater in Oxford will screen the film on October 2, 2009. Doors open at 7:00 p.m. for a cocktail party, followed by a documentary about the film, and then the movie itself. Claude Jarman, Jr., the child star who played one of the central characters, will lead a discussion after the film. The event is a fund raiser for the Oxford Film Festival. Betty Boop and Cab Calloway in "Minnie the Moocher"
Betty Boop and Cab Calloway are at it again with another gem from the Internet Archive. This time, Betty has another one of her weird adventures, assisted by Cab and his trademark tune: Minnie the Moocher. 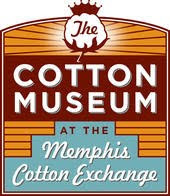 The Memphis Knights Big Band will perform at The Cotton Club in the Memphis Cotton Museum on Saturday, August 15, from 7:30 to 9:30 p.m. Tickets are $10 in advance and $12 at the door. I must confess that I have not heard the MKBB perform, but their playlist is certainly swing/big band material. I have been to a Cotton Club event before, and had a great time. The Cotton Museum is located at 65 Union Avenue in the Cotton Exchange Buidling. Inventor, jazz man and musician extraordinaire, Les Paul passed away today. From the guitar that bears his name to multitrack recording, the music world, as well as the rest of us, lost a legend today. Here he is (center) with the Les Paul Trio and Bing Crosby. The Red Hot Lindy Hop continue their weekly dance sessions this Friday at the Rumba Room. Free Lesson at 7:00 pm. DJ Music until 9:30 pm. Free before 7:00 pm, $5 at the door after 7:00 pm. Dress Code - Dress like you're going out! This Week 08.14.09 - Lesson with Mike & Amanda. Music by Amanda. Make: Online is posting a series of articles asking the question: "What happened to those flying cars we were supposed to have by now?" In this second installment, we learn that at least one working prototype took to the road/air in 1947. 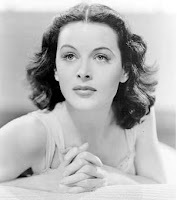 Widely regarded as the most beautiful woman to ever appear on film, Hedy Lamarr also helped develop "frequency hopping," which eventually became the basis for the U.S. military satelite defense system, as well as mobile telephone technology. Boing Boing has a post with a link to the full article. WARNING: The full article should probably have a PG rating due to one still photograph from some of Hedy's early film work in Europe. Tonight and Saturday night, WKNO Memphis, Channel 10, will air The Big Band Years. I have not seen it yet, but if the description is accurate, it looks to have some interesting film footage of the era. Make: Online posted this item about a 1930's educational film explaining the mechanics of differential gearing, produced by a company somewhat familiar with the technology: Chevrolet. This cartoon is one of my all time favorites from the Internet Archive. It features an Abbott & Costello parody, a Victory garden, a reference to the Hays Office; and of course, what I understand to be Tweety Bird's animation debut, before the censors made Warner Bros. clothe him with the now iconic yellow feathers. Be Cool! With No Moving Parts? From Make: Online, an interesting item about the IcyBall, an early form of refrigeration patented in the late 1920's, the basic principles of which are still in use today. The originals are valuable as antiques, but the article includes a link to modern homemade versions, complete with instructions on how to build your own! I'm a little late with the Red Hot Lindy Hop announcement this week, but better late than never. Doors open at 6:30 pm. Free Lesson at 7:00pm. DJ Music until 9:30 pm. Salsa 9:30-until? This Week 08.07.09 - Lesson with Becky & Kirk. Music by DJ Becky. NEXT WEEK 08.14.09 - Lesson with Mike & Amanda. Music by Amanda. 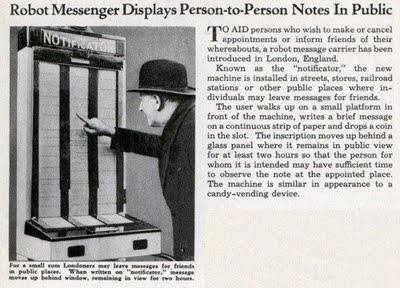 From Modern Mechanix: Although not as mobile as a cell phone text message, this 1935 "Robot Messenger" served a similar purpose. When I heard that expression in old cartoons as a kid, I did not understand its meaning. Years later, after learning about the strict rationing of everything on the home front during World War II, I realized it was a slogan to encourage civilians to limit their nonessential travel. 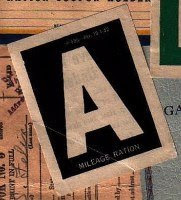 World War II Rationing is an interesting collection of images and information related to wartime rationing. Off the cob? Dig this righteous jive! 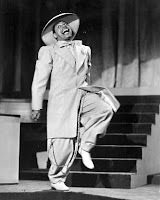 There is no better description of Cab Calloway's The Hepster's Dictionary than the Forward from the author himself. I don’t want to lend the impression here that the many words contained in this edition are the figments of my imagination. They were gathered from every conceivable source. Many first saw the light of printer’s ink in Billy Rowe’s widely read column “The Notebook,” in the Pittsburgh Courier. Here is some heavy animation artillery from the Internet Archive: a Tex Avery short from 1939, when he still worked for Warner Bros.